Looking After What We Have. It was good to see some new faces at the October event where about a dozen volunteers cleared the understory of the small new woodland next to the fireplace in the southeast corner of the green burial site. The area now gives the feeling of what the present burial field might be like once burials have taken place and the trees that have been planted start to grow. Before the weather turned colder and damper, father and son, Will and Frances Lawrence, arrived. They have been camping out in the woods these past weeks and helping out when Frances has not been involved with Wild Things! events or training sessions. 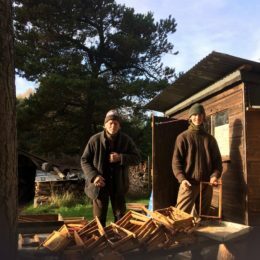 They have been a splendid help in putting the bee hives to bed for the winter and starting to go through a mountain of old bee equipment, cleaning frames and helping chuck out what is too far gone. Will and Frances have also been helping Kajedo, our land manager, who has been out using the new brush cutter maintaining and widening the semi-natural firebreak which is to the west of Wilkies Wood and to the north of what has been called Lyle’s Wood. This is where Lyle Schnadt, main builder of the Community Centre and the Universal Hall at the Park and founder of the energy conservation company Weatherwise Homes (some of its work now taken on by local firm AES Solar), was buried in 2000. 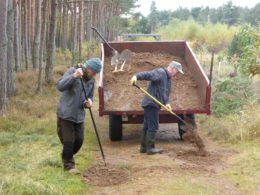 His was the first green burial on the land and you can find out more about the story of how this came about by following this link. Another annual maintenance task has been filling in the hollows and bumps of the forest track to the burial site and on up to the wind turbines. 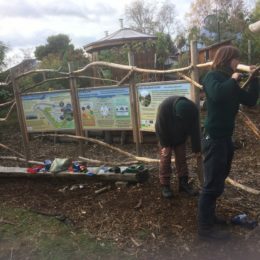 The FHT receives a welcome income of over £300/year, a tenth of the amount paid to the Findhorn Foundation as rental for having the Findhorn Wind Park turbines on their land, for carrying out this task. Hygeia Foundation Donation. John Clausen, President and Director of this U.S. charity whose mission is “to promote respect for all life and awareness of the interconnectedness of all creation,” was impressed by the positive work of the FHT during a recent visit and has arranged for an initial donation of £500 to be gifted this year with further annual donations of at least £300. These gifts are very much appreciated and will be used wisely to promote the work of the trust. Thank you John and Hygeia! More information about Hygeia can be found here. Integrated Management Plan – Progress. A contract with Chris Piper has now been signed and the scope and timeline for the work agreed. A draft plan structure with aims, objectives and vision will be submitted to the FHT trustees for approval by the end of November with a first draft produced for you and other stakeholders to comment on by mid January, final draft incorporating changes by the end of February and signing off by mid March 2017. It will be good to finally have clear guidelines for the FHT’s direction and projects over the next five years that incorporate and integrate information from the public Consultation Vision Document 2016, the draft Local Biodiversity Action Plan 2013-2018, the Findhorn Dunes Trust Lichen Survey and other important documents.